There are several haiku written about Hot Springs and one of them I love to share here with you. It's a haiku written by Matsuo Basho, my master. Basho wrote the following haiku on Mount Yudano (bathroom). 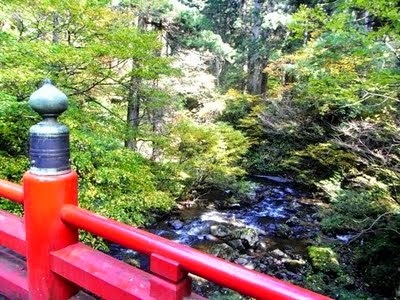 On this mountain was a spectacular waterfall which had been a Shinto place of worship since early times. Only men could visit it and only after a rigorous climb with several rituals and services in various temples. At the gate, after purification rites, they must remove their shoes to climb the rocks barefoot. In addition, before being allowed to view this wonder, each men had to swear never to reveal what he witnessed there. In modern times, in interests of disclosure, the secret of Mount Yudano has been revealed. Due to the wearing away of the rock and the reddish minerals in the thermal-warmed water, the waterfall looks exactly like the private parts of a woman complete with sounds and gushing water. The practice can be thought of as worshipping the reproductive aspect of the feminine earth. The priest Ekaku had asked Basho to write some poems on his visit to the three holy mountains of Dewa. Basho couldn't do that because it was an awesome experience for him and so he couldn't find the words. Also it was forbidden to talk about what he had witnessed on the mountain. There is a hot springs that I haven't been to in years. One can go into caverns. It always seemed to me like being in a womb. Glad you liked the post ... hotsprings are heaven on Earth ... and so much more wonderful when it's cold outside ;-) a pleasure visiting!